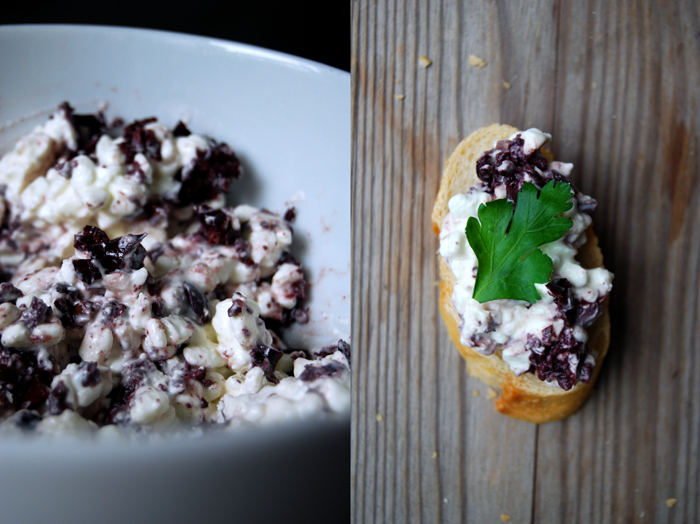 Creamy cottage cheese mixed with dark purple Kalamata olives, garlic, herbs, Balsamico vinegar, that’s what I had in mind when I started my sandwich preparations. 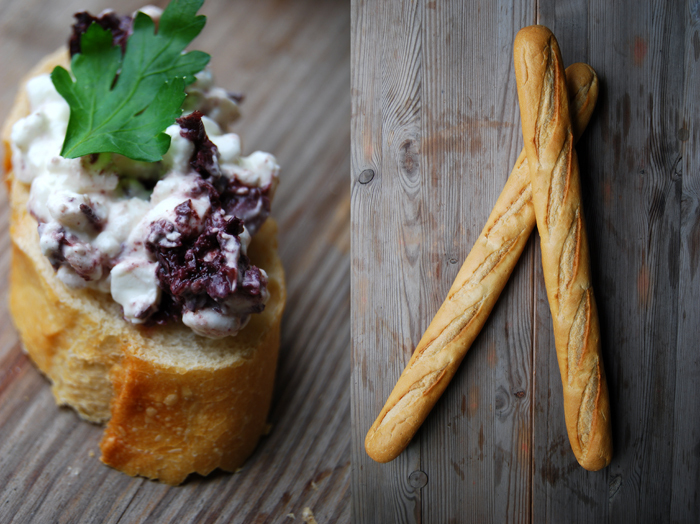 My plan changed abruptly as soon as I stirred the chopped olives into the crumbly cottage cheese, I stopped turning the spoon before the oily black mixture blended into the creamy white, the contrast looked so beautiful! I tried some of this puristic spread and I was so impressed by its intensity and simplicity that I dropped everything. 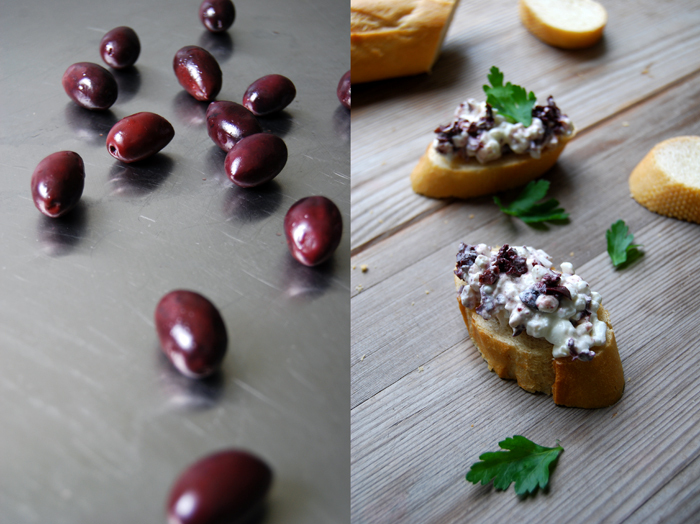 This combination is too good, Kalamata olives (to me, they are the best black olives in the world!) 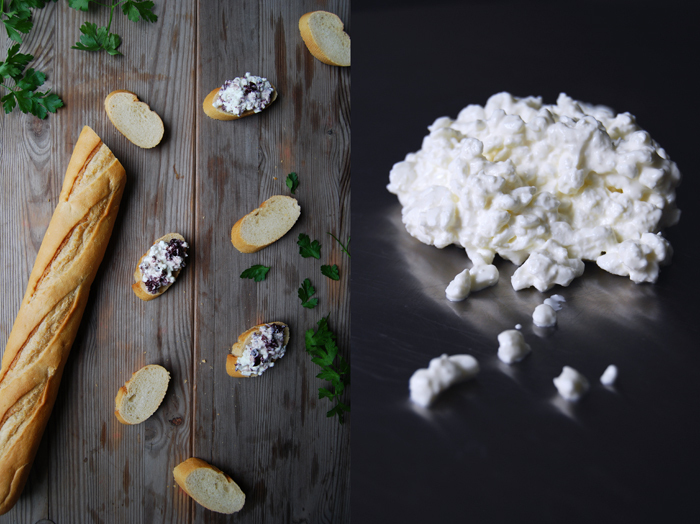 plus cottage cheese, no distraction, no further addition, just a few slices of fresh baguette and one parsley leaf on top, that’s all it needs! This is the quickest and most simple recipe I’ve made so far for my Sandwich Wednesday and it’s already one of my favourite sandwiches! 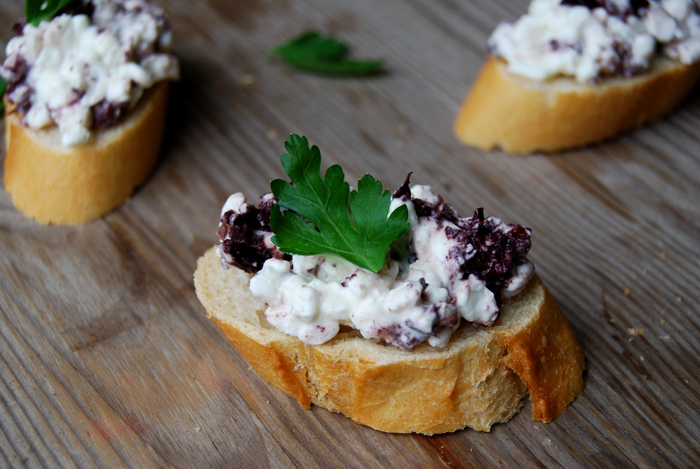 If you’re looking for a quick snack, a picnic treat, an easy dinner or just a nibble with some crackers, pull out some cottage cheese (200g / 7 ounces) and mix briefly with 50g / 2 ounces (or more) of chopped Kalamata olives. You could use other black olives as well but the large Greek fruits from the Peloponnese region have a wonderful aroma, exactly what you need if you mix only two ingredients. I didn’t want to over mix it, I only stirred it twice before I spread the cheese on tiny slices of baguette. The green fleshy parsley leaves on top finished it off and added a fresh taste to this composition. I loved it so much that I ate one slice after the other, it was just enough for 2! 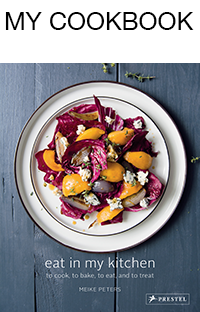 Put the cottage cheese in a small bowl and add whole, pitted Kalamata olives and brine without stirring. Delicious without any bread at all.